We finally visited Coconut Cove Water Park in Boca Raton at the end of the summer last year. It is on my list of favorites for sure! It is pretty easy to get to in West Boca so that is always a good thing. The water park itself is clean and pretty big too. In fact we liked it so much that we went back the next day! I didn’t get great photo’s because, well, I was too busy enjoying myself with my daughter and friends, which is a good sign. We spent most of our time switching between the 897-foot lazy river ride (I love these ), and the Children’s water playground. The children’s area is very nice with all the normal water manipulation levers and cranks, dumping water buckets and slides. The kids loved it! There is a Lily Pad Walk where you can hold onto ropes above your head and “walk” on the “Lily Pads” across the pool as well as a couple of four-story high water slides. My daughter was too tiny for the big water slide and the Lily Pads last summer so hopefully I will be able to get some more pictures this summer and update you on these. 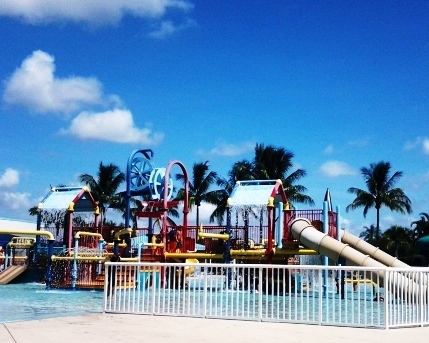 Coconut Cove park also has a lap pool, locker rentals and showers, and of course a concession stand. We are definitely going back there this summer so I promise to get better photos and update this post. 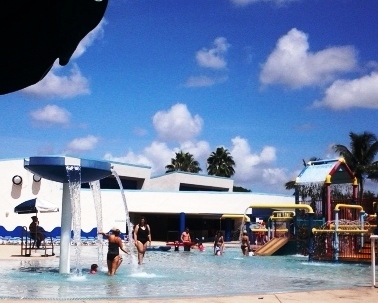 This entry was posted in Events and Reviews, Florida, Summer Picks, Uncategorized, Water Play and tagged Boca Raton, pool, South Florida, Splash Park, Summer Activities, Water Park by Cynthia Buckley. Bookmark the permalink.